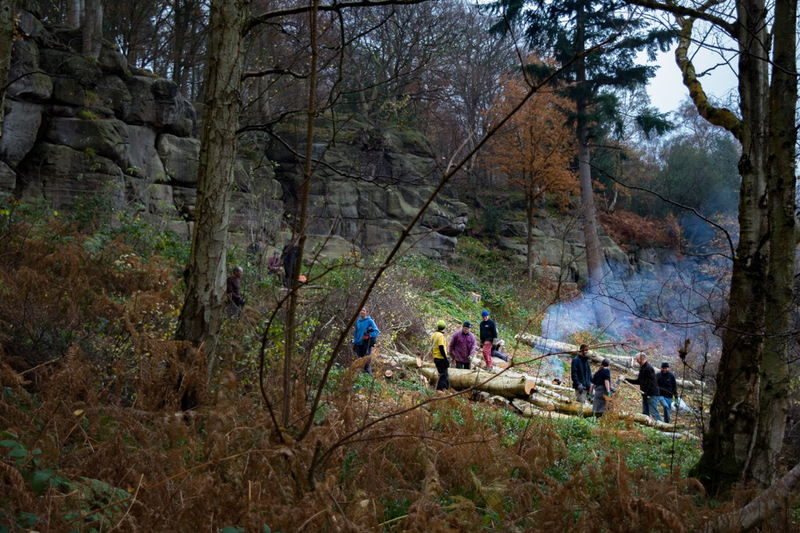 The BMC work-days in November were supported by over 20 volunteers across two days in total, and the weather was drier than forecast which was a result all round! Bob Moulton, long-standing and dedicated Harrisons Rocks Management Group member, reported: "A lot of brashing was done and logs carried up to and below the rocks, revetments were reinforced at the top of the area that had been cut." Bob also noted that "the old revetments that had been put in as recently as 2012 are still in reasonable condition but buried in sand, which shows that this work done back in 2012 was doing a good job." Additionally "work was also done below the Bow Window area to block off an unofficial path and to rebuild some of the steps in that area. The drain-offs below St Gotthard and The Vice areas were dug out again." "A team of strimmers were hard at work on the lower path and Tim Skinner (HRMG) has now planted a number of saplings all along the lower slopes." The HRMG (BMC) wishes to thank all those who turned up on this BMC work-day, as well as those who have supported the event in other ways.